Bridging Worlds is a series by LA-based artist and VGT author Eron Rauch about the blurred line between games and art. His multi-part essay "Demystifying MOBAs" takes an in-depth look at the game design of esports and MOBAs. This is the final part. Watching ten people sit hidden behind computer monitors on a stage might sound like the very stuff that purgatory is built of, with a barrage of swirling laser lights and dubstep blasting only adding insult to injury. But a massive number of people have come to love watching esports, and by massive I mean top tournaments for Defense of the Ancients 2 (aka Dota2, by Valve Corporation) and League of Legends (aka LoL, by Riot Games) can draw tens of millions of viewers, which is on par with top traditional sporting events like the baseball World Series. Blizzard/Activision’s Heroes of the Storm (HotS) doesn’t draw quite as many viewers, but was only launched in the middle of 2015, and is backed by the company that has historically been a pioneer of esports via StarCraft. Aside from the interest of amateur players in seeing the best plays in their favorite game, part of the attraction is that these events are produced to resemble a reality show version of massive medieval pageants. As David Shoemaker has laid out in an amazing book called The Squared Circle, professional (aka staged) wresting started as a circus sideshow and has wandered the back alleys of culture through generations of children through iconic characters from World Wresting Entertainment (WWE) like the (now disgraced) all-American mustachioed Hulk Hogan and the villainous (possibly undead) Undertaker. Shoemaker’s critical point is that almost unnoticed, professional wrestling’s style of storytelling, with its soap opera mix of reality show theatrics and stark dramatic archetypes, has become the core way that almost all sports broadcasting is handled. Combining reality television’s heightened drama with broad theatrical tropes for telling stories of struggle and triumph turns out to be a formula that can salve the oft-chaffing complexity of sports arcana for novices and the boredom that broadcasters dread during dull parts of the game. In esports, how can you do anything but cheer for the plucky SumaiL (Syed Sumail Hasan) as the casters explicate how he started playing at eight years old in Pakistan and was so poor he had to sell his bike to get money to play Dota2, emigrated around the world to play for the American team Evil Geniuses, and now at age 16 is sitting on stage in the finals with ten million dollars on the line? LoL is the industry leader at promoting MOBAs as esports, and a large part of that reputation rests on their rapid professionalization, almost weaponization, of their esports broadcasts. 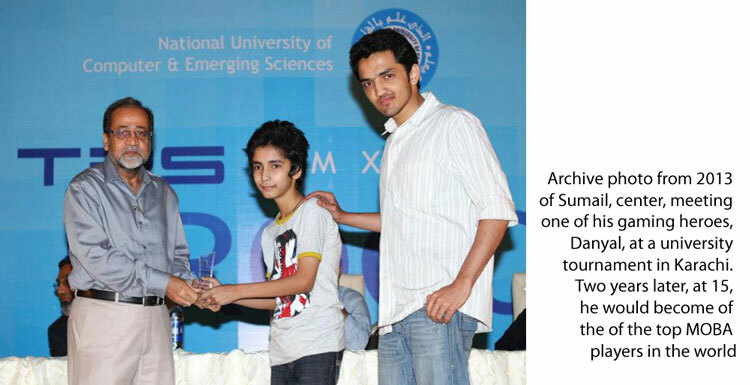 One of their big influences is actually the much-maligned Ultimate Fighting Championship (UFC). Though this seems odd at first glance, this association makes complete sense if you understand that one of the quintessential problems that UFC presents to a viewer is that the sport is literally “Mixed Martial Arts” (MMA) meaning that matches span dozens and dozens of different historical and complex martial arts from all over the world. A given match might take elements from the Israeli army’s self-defense system, ancient Chinese styles, and Western boxing, used in combinations and modulations all within another rule set for scoring implemented by the UFC. Even the most dedicated viewer can’t be expected to understand the specifics of Muay Thai kickboxing as well as Olympic wrestling and how they interact. The same problem exists in MOBAs, with a hoard of complex characters, items, and rule interactions that beguile even the casters. But borrowing the traditions of professional wrestling, the production teams in MMA build narratives around the athletes while simultaneously relativizing the actual sporting elements. The production team might explain the match as, “This one guy has six kids and is fighting to make his sickly Dad proud, while in the other corner you have a bad boy who races motorcycles and talks trash about everyone,” which sets up the emotional and narrative stakes. Then during the match, the MMA broadcasters will tend to take open moments to explain the most stripped down version of the technical aspects, such as, “This fighter is really strong at punching, but not very fast, so the other fighter, who is weaker but more nimble, can only win through cunning and high risk maneuvers.” These framing aspects of emotional stories and broad technical explanations are amplified and reiterated throughout a match and highlighted during the inevitable pregame videos with the athletes where they are shown training, talking, and even hanging out at their houses just like in reality TV. Unlike baseball which historically had one announcer, modern sports broadcasting, including esports, uses a variety of analysts and casters to create tension and drama. The first of these groups is made up of former professional players and high level statisticians with a personable moderator, and they handle the pre-game and post-game breakdowns. The analysts become something of a sideshow themselves, dramatically arguing about the correctness of their opinions and statistics often with the aid of silly props. During the match there are two or three casters, one of which does play-by-play while the second is a “color” commentator who mixes together repetitive explanations of fundamentals and exciting descriptions in the form of humorously elaborate analogies. If there is a third person on the caster desk it is either a fan favorite personality as a guest, or a former pro that has specific experience that is relevant to the match. LoL followed this system fairly closely when it built its broadcasting style, and Dota2 and HotS have followed suit. Riot Games’ decision to adopt modern sports stylings and systems has even affected non-MOBA games like StarCraft which have traditionally been under the sway of the Korean model of broadcasting, which is more akin to the way that football radio announcers compete to whip each other into a constant verbal flurry. Dota2 has even provided some interesting additions to the now-typical MOBA style and hired a professional improv comedian Kaci Aitchison, who barely knew anything about the game when she started her tenure but brought a wealth of on-screen experience, to fill the role of host for the last two International tournaments. Her role was to bind together the diverse broadcast elements and act as a strong on-screen character counterbalance to the more inside-baseball and proud-amateur nerdy aspects of the typical MOBA esports production. So far I’ve left out HotS because there have been so few major tournaments that getting a consistent sense of style has been difficult. 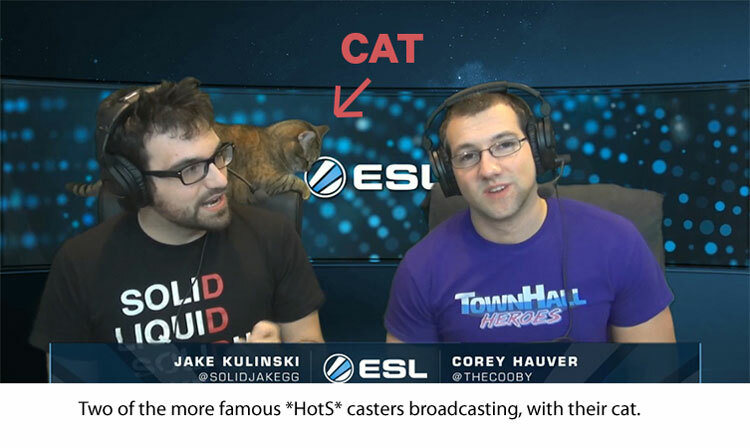 Most of the smaller HotS tournaments have been held online, so typically it’s up to the caster or casters to determine the broadcast style themselves and talk through the drama in front of a home green screen setup, occasionally joined by their cat. This relatively amateur aspect of HotS casting has actually been discussed with great nostalgia by fans who have grown used to the ultra-slick LoL broadcasts. Even with my interest in this realm of esports, a large part of my love for it was based on how little it resembled the overly-loud, overly-manic television sporting events. The absolute antithesis of the overly slick and commercialized sports broadcasts is epitomized by the infamous StarCraft tournament HomeStory Cup, which while a major event, was also based on a premise that flew in the face of all traditional models. Some fans, myself included, fear that unfettered professionalization will sterilize the fun and goofiness that initially drew so many players to esports. The idea for HomeStory Cup was simple: some of the top casters in Europe would invite a couple dozen top players in the world to live with them for a week and play a complete tournament in their living room. People slept on the floor, went to the bar downstairs, cooked communal pots of chili, and played poker, all while the matches were going on. It was complete chaos, but led to untold amusing off-the-cuff storytelling moments combined with incredible access to the best players in the world; also a massive number of hangovers. Some fans, myself included, fear that unfettered professionalization will sterilize the fun and goofiness that initially drew so many players to esports. In fact, the height of stilted esports events was recently achieved by the HotS Heroes of the Dorm series, which felt more like an infomercial than a tournament. The analyst desk was clearly reading from a stilted teleprompter script for a vast majority of the broadcast, and spent most of their time pitching reasons to play the game while canned promo footage ran on the screens behind them. While the UFC and WWE models are the most dominant, one aspect that makes esports unique from traditional sports is that the players are actually manipulating characters that exist in a unique narrative world. However hokey and trite, in LoL Jarvan IV and Shyvana are characters who have an elaborate melodramatic relationship to each other and the world around them. If they are both on a team together, casters could talk about J4 and Shy’s old friendship, while if they are opposed there is the story of the falling out of the warrior prince and the fearsome but lonely half-dragon. In some ways, casting esports can resemble the nearly-lost Japanese tradition of the the benshi. The benshi was a person who stood beside the movie screen during the era of silent films and theatrically and improvisationally, told/re-told/remixed the narrative to the audience. StarCraft 2 casts (especially those under the helm of personality Day9) often resembles this style of narrative improvisation, where during slow moments casters retell the what happened in the match in story form. Perhaps it is a heroic story of a group of space marines who were valiantly sneaking into the alien base and managed to discover a completely unexpected army of giant bugs; perhaps it is a tragic story a group of perfectly content workers, mining on an asteroid that were ambushed and evaporated by a cloaked alien ship. Laden with these sorts of RPG and mythic elements, future MOBAs and esports could exploit or emphasize this theatrical element in novel ways. In fact Smite, the fourth most popular MOBA, can be very strange to watch as a spectator since all of the characters are gods and goddesses from traditional mythologies. 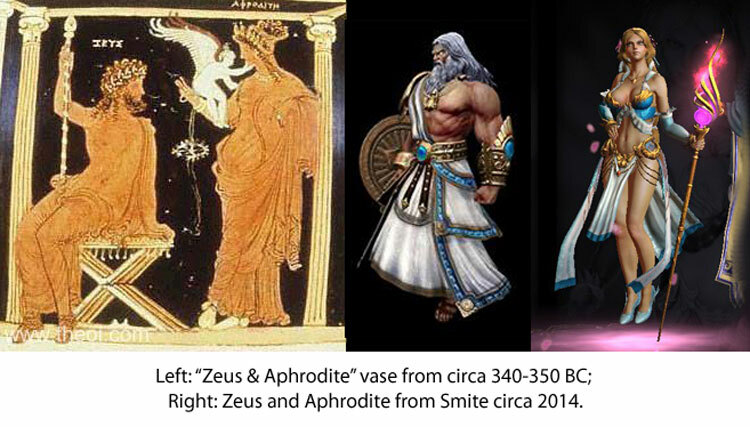 “Zeus cast a lighting bolt but Aphrodite dodged it and Bacchus got angry and tried to beat Zeus with a wine jug,” is a perfectly legitimate narrative both for the ten players sitting at computers around the world playing Smite and for a band of Greek warriors telling stories around a campfire on a beach during a siege some 3000 years ago. 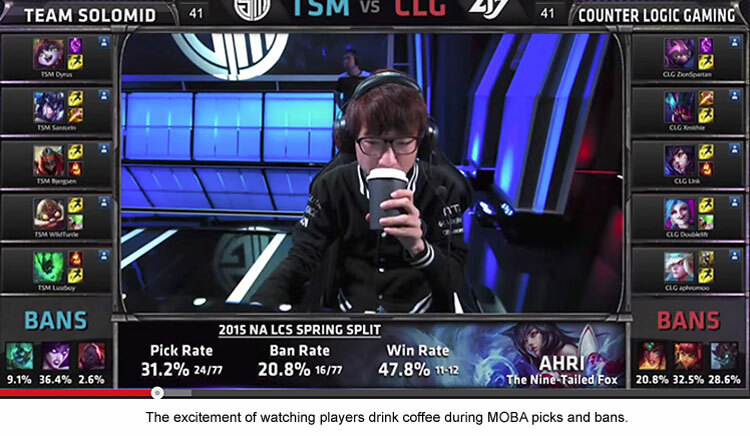 But even more interesting are recent advances in the use of augmented reality elements in esports broadcasts. That is, elements that blur the boundaries between two dimensional screen and the real world. The recent Dota2 International had a stage that was set up in the middle of the stadium, similar to a boxing ring but lower to the ground. Using a series of projectors located directly on the ceiling facing down, a unique view of the game from above was projected on the floor in the midst of the competitors. Spell effects that players would use in the games would cascade like fireworks across the stage floor in the rough location where they were happening in the game. The recent Blizzcon Hearthstone tournament had an elaborate stage set for the players that recreated the wood paneled and warmly torch-lit fantasy inn in World of Warcraft where the game takes place. But perhaps most astounding is the Blizzcon StarCraft stage, which is a 130 foot long 40 foot high sculptural space that uses 24 synced projectors to run an elaborate projection map system during games. Projection mapping is the sophisticated technique where computer software is used to warp and bend two dimensional imagery so that it is possible to seamlessly project on to three dimensional objects to make those objects appear animated. The StarCraft stage is a marvel of digital technology, featuring a constantly shifting swarm of different in-game screens, video feeds, computer effects animations, and elements from the game, as well as housing the booths for the players. The fusion of these sorts of advanced 3D hybrid-reality technologies and video games, which are all run on sophisticated 3D modeling systems anyway, are one of the most exciting potential areas for exploration for future esports live events. Uh, Let’s Go To A 30 Minute Commercial Break! Owing to the structure of professional play, one of the great challenges for broadcasting MOBAs as sports is that the length of any given series can vary wildly. Dota2 has by far the most variable game lengths. Games can be so short that drafting picks and bans can last longer than some individual games. In fact, a game at last year’s International 4 clocked in at merely 14 minutes and 37 seconds. Games can just as easily become a stalemate. For instance, one 2015 game between the teams Cloud 9 and SFZ broke all records when it clocked in at 3 hours, 20 minutes, and 34 seconds! Considering that most tournament matches are played as best of threes or fives, a complete 3-0 stomp can be over before the casters get to talk through the players’ bios (and leave live audiences disappointed), while a drawn out match that goes to the fifth game can see the casters losing their voices. In fact, a few esports matches have run so long that the venue closed down before all the games were played and the audience was kicked out while the players were left to finish the match in an empty room. Early on, LoL game times used to be quite variable. There was even a phase in the twilight mists of yore where certain European teams figured out that the best way to win was to stall every game well past the hour mark to fatigue their opponents. In response to these scenarios and other, Riot has very actively tuned elements of modern LoL to make game times both shorter and more stable. Most game times follow a bell curve peaking at right around 35 minutes. The shortest game in the recently concluded League Championship System (LCS) Worlds Finals was 23:49 long (CLG vs. Koo Tigers) and the longest came in just shy of an hour at 55:27 (TSM vs Origen). Even with more stable game times, even tightly controlled MOBAs like LoL can struggle to retain consistent engagement for a viewer because the act of closing out the game by breaking the opposing team’s base often becomes pro-forma but time consuming. Caster Montecristo (who plays the villain character on the Worlds analyst desk) has been known to correctly declare a game “over” as early as four minutes based solely on a single blunder. HotS has the unique position of being designed during the time when the early MOBAs were already coming into the mainstream. So even though the large pool of maps all have different systems and strategies for winning and hence should have quite variable game length, Blizzard has introduced numerous elements, from ramping character lethality to objectives that have an ever-increasing potency, to make sure games tend to finish at no longer than half an hour. This is all in accordance with the Blizzard designers’ stated intent to create a game that wouldn’t stagnate. In HotS, if a team has a clear advantage they should be able to push to finish the game quickly, while the only games that tend to run long are between teams that are evenly matched and tend to also be the most action packed for a viewer. Comebacks, the great lifeblood of sports casting, happen but infrequently in MOBAs. This sense of smothering inevitability coupled with long game times greatly contributes to the challenges of presenting a consistently entertaining broadcast of MOBA matches. As I discussed in part 4 of this series (“A Charming Stroll Through Flatland’s Battlefield” ) all three top MOBAs have systems that exponentially reward winning teams and punish losing teams. This is most clearly highlighted by the statistic that the team that takes the first inhibitor in LoL has upwards of a 85% likelihood to win (as high as 100% for some tournaments like the 2014 All Stars). In Dota2, for The International 3, the first team to destroy a barracks had a 96.36% chance to win the game. Though it is worth keeping in mind the caveat that Dota2 pro play has the unique aspect that games typically end in a surrender, so in many ways taking a racks is usually viewed as the end-game. Teams almost never surrender in LoL though it is technically possible, with surrendering being considered either a sign of a total mental collapse of a team or that they felt cheated by the outcome. In HotS, because of how the game is designed to snowball the leading team to victory, there is no surrender option, just a mercifully short crushing under the heels of some ten story tall magic-powered skeleton or the like. One burgeoning aspect of esports is their relationship to sports bars and sports drinking culture. The first esports/gaming bar just opened in Paris, called Meltdown, but events known as BarCrafts have been a part of the esports world through StarCraft for quite some time. Basically, a BarCraft is when a group of avid StarCraft fans organize a takeover of a local sports bar and convince the bar to play the stream of a major tournament over the TVs. Usually these are quite elaborate events, filled with raffles, costumes, theme drinks, and sponsored giveaways. These events tend to happen in major cities or near large universities and became one of the primary ways to originally experience esports live since the tournaments were usually hosted in Korea. The MOBA world has continued the tradition of these pun-named events with PubStomps (the name is a pun on a slang term for higher level players crushing novice players in a random “PUBlic” match). Dota2’s slightly older fanbase tends to be the foremost continuers of this tradition, and Valve pushes fans to host these events especially during their biggest tournament, The International. Recent International websites have included a list of PubStomps and broadcasts have even aired live clips from PubStomps around the world as filler. That said, there are very few of these PubStomp events since the only other company sponsored tournament happens in China during very inconvenient, or downright illegal, hours for a bar to be open. No one, not the farmers, high school teachers, construction workers, or local lawyers that frequent that bar paid any mind that a video game competition was playing instead of a traditional sport. LoL traditionally has a younger fan base, so Riot has publicly encouraged fans to band together for “viewing parties” which are then listed on the LCS site, and can vary from small living rooms filled with a few friends to thousands of people gathering in college recreation centers. HotS didn’t have a large enough tournament for this sort of event to happen until Blizzcon this year which drew away most of the fans who would have otherwise gone to a BarCraft style event. 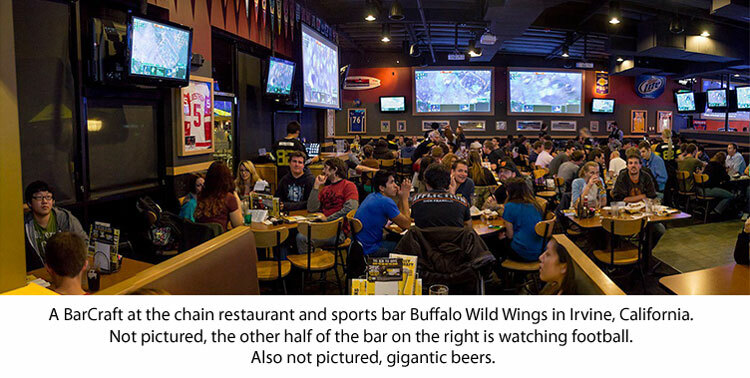 But given Blizzard’s support for these events in the past, such sending as staff to make guest appearances or lots of merchandise to give out at BarCrafts, it seems likely they will continue to encourage fans to raid the local pub and watch their favorite game while pounding a few pints. While these rare specialty events have been the standard way for fans to gather to watch esports in the past, as the age of these first generation of MOBA players rises alongside the public acceptance of video games, it will be curious to see if there will be more public viewing of these events. This is especially true given that sports mega-broadcaster ESPN has shown great interest in broadcasting this material on traditional cable channels. In fact this Fall I was visiting the rural Midwest for a family wedding and when I popped in to the local bar, ESPN’s coverage of the International 5 was spread over the dozen massive flat screen televisions that is seemingly a prerequisite for any bar in America these days. No one, not the farmers, high school teachers, construction workers, or local lawyers that frequent that bar paid any mind that a video game competition was playing instead of a traditional sport. Though when I asked the bartender if there was any special reason it was on, she accidentally answered with a nonchalant portent of the future. They simply always leave the TV on ESPN. Historically the video game market, rife with tech sector optimism, has often behaved as though any trend can only go up. While the rise of esports to public consciousness has been astoundingly fast, as the swath of failed and canceled Massive Multiplayer Online (MMO) games that companies developed to cash in on the unprecedented success of World of Warcraft indicates, the future of other MOBAs to gain any market share is deeply uncertain. Smite, a novel First Person Shooter (FPS) MOBA hybrid has been around for almost as long as LoL and while Smite is the fourth most popular MOBA, it only has a paltry 2.5% market share and has tournaments’ stream viewers that number below ten thousand. The recent cancelations of Electronic Arts’ MOBA Dawngate and Turbine DC’s superhero themed MOBA Infinite Crisis have shown just how hard it is for even top video game companies with strong licenses to make a successful foray into the esports world. Though massive amounts of money are being spent to follow the MOBA trend, a critical lesson to remember is that the whole MOBA genre was started by fans making a totally new game out of tools from Warcraft 3. This sort of bedroom evolution is similar to the way that playground games will inevitably develop as long as there is a field and some players. One other historical note that highlights the idea that trends in esports evolve with collaboration from fans is that despite Microsoft, Sony, and Infinity ward constantly pouring money into promoting Call of Duty as an esport, it is vastly superseded by the nigh-ancient in game terms (1999) FPS Counter-Strike, which itself was started as a mod for Half-Life. One area of potential organic growth is in the still unexplored area of tablet-based esports, though the first steps seem to have been charted by Blizzard’s Hearthstone online collectable card game. Interest in the Hearthstone professional leagues has already vastly overshadowed HotS so perhaps this suggests that yet more models of esports will evolve from the new technologies gaining a foothold in our lives. It’s worthwhile to mention that with all of this money swirling around MOBAs and esports, the inevitable dark side of professional sports comes right along into the virtual world. Cheating has already happened at even the highest levels of these games. 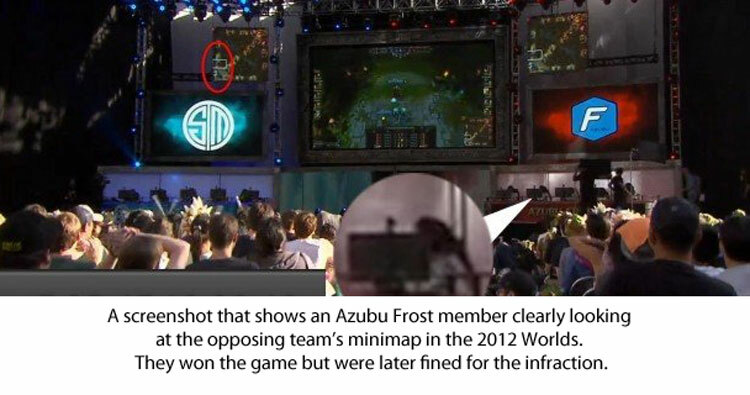 Memorably, Korean team Azubu Frost, in the 2012 LoL World Finals became permanent villains for watching the production screens during a match to see where their opponents were. Though that was at least partially Riot’s fault for putting screens in such a way as to be optimal for the audience, but where players could see them on stage. There have been a number of high profile cases where investment was gathered to build a major esports team and then the management absconds with the cash leaving the players and investors high and dry. There have also been a number of high-profile match fixing cases and cases where players have thrown games after betting against themselves in gray-market betting sites. In fact, in one extremely troubling case a professional Chinese LoL player tried to commit suicide after the organization pressured him to fix matches. The sloppy, egotistical, and sometimes downright offensive public behavior of athletes has also become a problem. Doubly so in esports because in most cases the Western players have not had any sort of mentor or coach to teach them sportsmanship or proper empathic adult behavior. This has included high profile LoL players being banned after making accounts with racist names while visiting countries for tournaments, and pro players getting year-long suspensions for regularly using homophobic, transphobic, and racist language in games. A top tier LCS player was recently suspended for selling fully unlocked tournament accounts (which are only given to LCS players) on the black market. One major StarCraft player was suspended for watching webcam performances of an underage girl and posting lewd comments about it. Doping has recently become an issue of note, though how extensive it actually is (or even effective) remains an open question. Recenty the use of Adderall, which is also a common “study-drug” on American college campuses, for focus has been alleged in various Kotaku articles. All leagues have explicit bans on performance enhancing substances but no league or company has any system of testing in place so the exact details of these suspicions remain hidden and based solely on player admissions. But given that millions and millions of dollars of prize money are on the line, and players are earning salaries on par with other major sports where doping is extremely common, taking an easily available low-side-effect Ativan for nerves or Adderall for focus before going on stage in front of 100,000 screaming fans seems rather plausible. As the infrastructure for esports starts to become embedded in colleges and in law, such as the US and Korean eSports visa specifications, all of these issues will have to be addressed sooner rather than later since these large social institutions have vastly more rules and expectations than the wild West of the purely online space in which esports arose. One of the other most popular up-and-coming esports style games is Wargaming’s World of Tanks (alongside its innumerable other World of War-Nouns brethren) but its business model brings up a very troubling prospect for future esports companies, which is the fretted about notion of “pay to win.” In World of Tanks/Warships/Warplanes, you play as said vehicle which can be bought in a similar manner to the three MOBAs, which is through either in-game currency or through real money. But in the World of… games there are various “premium” ammunitions, consumables, and even special vehicles that can only be purchased for real money. In fact, with premium ammunition, you pay a certain small amount of money per shot in a match to get a better shell to fire than someone not paying real money per shot. This sort of insidious “pay to win” aspect is unfortunately part of mobile gaming’s ever more occult attempt to harpoon their “whales” (as they call people who spend insane sums of money on a game), which makes Wargaming’s embrace of the concept on PC and console in a competitive esport environment even more troubling. “Pay to win” is but one obvious facet of the troubles that can arise from a single company controlling all aspects of a sport, including the very legal holding of the game itself, in the hands of one company much more subtle abuses are possible. Why these sorts of conflicts of interest are so troubling in esports might take some additional explaining. In the case of traditional sports like baseball or football, no one owns the underlying game itself. That is, no one owns the idea of two guys beating each other up, even if they own the name “Ultimate Fighting Championship.” If UFC does a terrible job and constantly cheats its fans and players, then goes bankrupt, another organization could easily arise. Players can still go to a gym and have a match in front of the local fans. If Major League Baseball went under, parents could still throw the ball around with their child. But if TenCent, the massive for-profit Chinese company who owns Riot Games, closes LoL, they own that property and no one could play LoL. Not only that, but because of patent law, basic mechanical and stylistic elements can be copyrighted or patented and could not be used by anyone else. This is a very real possibility considering that Riot bought a huge swath of patents pertaining to MOBAs and esports. They claimed that they were doing it in an altruistic way with the hopes that patent law would be changed for the better, but they are under no legal obligation to remain altruistic. For example Magic: the Gathering’s parent company Wizards of the Coast owned patents on rudimentary game elements like turning a card to the side to show that it is used. These patents were transferred to board game giant Hasbro when Wizards of the Coast was bought and has been strictly enforced to squash competition from small collectable card game companies. In the case of esports, the game companies also administer the esports rules, pay players, and craft the game balance, all while first and foremost being a for-profit company trying to make money for their investors. “Pay to win” is but one obvious facet of the troubles that can arise - much more subtle abuses are possible. While everyone is currently excited to see video game competitions on ESPN, the clear conflict of interest hides in this assumption of benevolence. Nothing prevents a company who has spent the better decade making a very fair, fun game, to suddenly get sold and start imposing draconian rules for players. 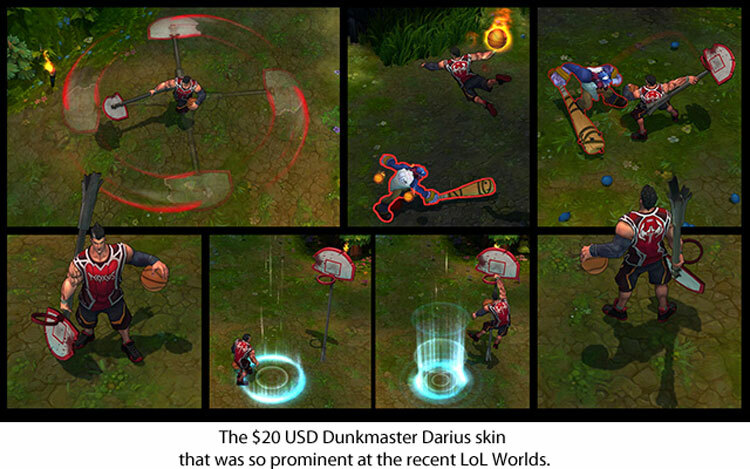 For instance, right now there is already significant grumbling amongst the LoL fans because it is hard to tell if it is it a coincidence or manipulation that TenCent/Riot launched a new real-money-only skin for the character Darius at the exact same time he was rebalanced to be one of the strongest characters in game. This combination of rebalance plus premium purchasable item is common in video games, but this case is troubling because it also happened to be right before the biggest tournament of the year, Worlds, where all the best top laners would now need to use that character. These players are almost all on the payroll of Riot, and all also just happened to almost exclusively use that skin which the casters, also on Riot’s payroll, regularly talked about as being the best skin. Whether this was coincidence, good marketing, or a cynical financial decision that drastically affected the outcome of the most critical tournament of the year, is extremely hard to discern and that very opaqueness becomes a major stumbling block for the long-term future of esports. Given the problems with the way the video game market tends to bunch up at the top with one or two dominant properties in each genre, and with the clear conflict of interest between game companies and fair sporting practices, perhaps new models might arise around the margins in the same way that the MOBA genre was created by fans. 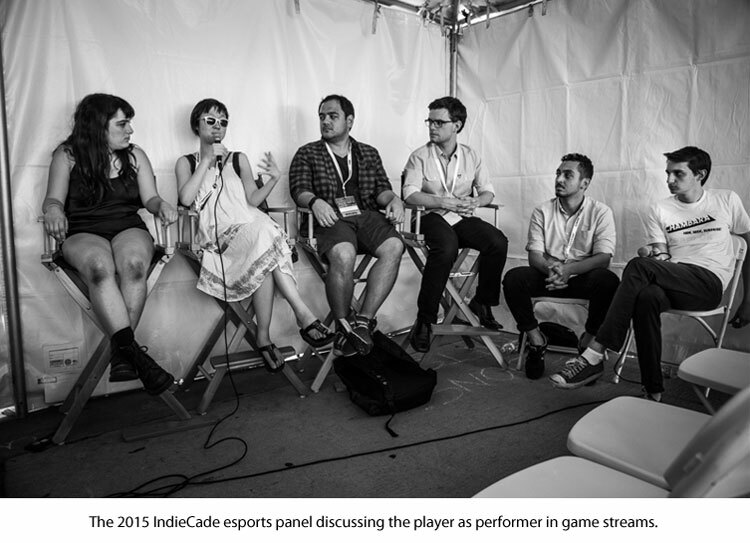 For instance, at the recent IndieCade esports panel, developer Winnie Song mentioned that in some ways the Olympics, with their pluralistic collation of games, from gymnastics to basketball, from shooting to skateboarding, might be a more useful model for esports than the monolithic Western single-sport stylings. This federation of games and competition, with its regular changing cohort of games (they are even thinking of adding ultimate frisbee!) presents other issues. Aside from the sheer difficulty of organizing any large scale of Olympic style video game events, which the World Cyber Games has found out, such widely spread mega-events have to contend with the very real relationship between economic stability and peak performance, such as the difficulties of being a full time player that came up our examination of the difficulties of DotA 2’s tournament structure. Additionally, what will happen when esports become normalized in culture? Will esports still be a special genre, or just another mandatory massive cost on game companies who want to make multiplayer games? What happens when there are so many esports broadcasts that they reach saturation much like podcasts now, when consumers can no longer even begin to consume all the content they wish to? Will these esports, formerly such radical and exciting accidental mutations of the digital fringes, simply become another conservative interchangeable entertainment default option to shovel advertising to a lucrative target demographic of consumer-fans? It will be interesting to see how all this esports boom evolves alongside the boom of other non-traditional sports broadcasting such as MMA, Magic: the Gathering, the various reality shows about real life ninjas, and the massive but totally unexpected rise of poker in America. In fact, at the 2015 Blizzcon, two world renowned professional poker players (one of whom is a former pro StarCraft player) are going to be doing a show match for Hearthstone, bridging the ever-narrowing gap between many new burgeoning sporting and gaming cultures. 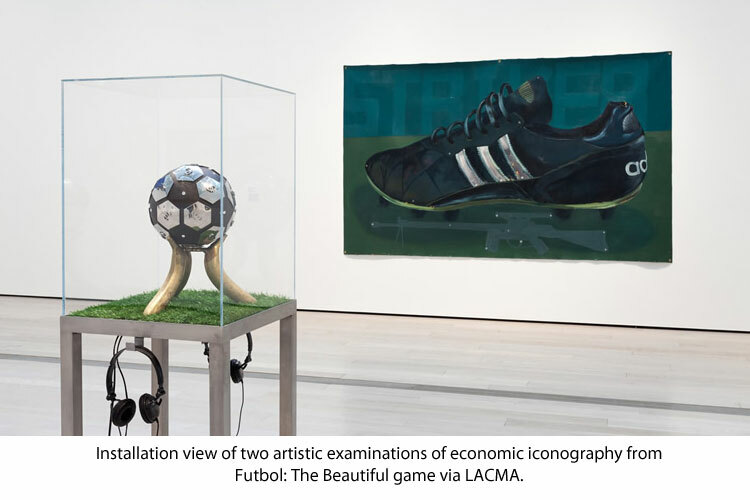 Within and around MOBAs and esports there are innumerable intriguing places to start thinking about modern society, potential new modes for art production, and the ways that the performative aspects of esports are changing our cultures’ relationships to video games in drastic ways. I spent the better part of my gaming time for about four years deeply involved with MOBAs and esports, particularly in LoL, and all of the experiences, both positive and negative, were the inspiration for thinking about video games and their intersection with the social labor of hobbies and infrastructure of fandoms. As such, much of this article is observational, speculation, and free-association, though every intention was made to double check any factual information and data when possible. Also important to note is that because these games are under constant revision I kept a bit of a broad lens to try to make this writing useful no matter how many post-season patches Riot pushes through. But some details will assuredly be inaccurate within moments of publication. In fact, in the middle of writing this HotS went from closed beta to announced date, to live, and from having a few informal tournaments to a massive organized global event. So inevitably there will be quibbles and inaccuracies but these very moments of slippage are hopefully still useful as a time capsule of this moment in esports. These MOBAs are like any other living sports in their first generations, evolving, modifying themselves, and adopting new goals and social norms faster than observers can notice. To close with a reflection on historical perspective, the defining feature of American football, the forward pass, was only introduced in 1906. The game had been played publicly since the 1820’s, which means that the current most defining trait of the one of the most watched sports took almost 90 years to evolve! Lest we get caught up in the futurism of esports right now, the first major publicly broadcast esport, StarCraft: Brood Wars came out in 1998, and the game that all of these MOBAs are based on, Warcraft 3, came out in 2003. That means we’re a scant 17 years along the timeline of these sorts of sports. Doing some (slightly facetious) napkin math, that means the “forward pass of MOBAs” will show up some time around 73 years, or the year 2088. Until then, who knows what curious games, broadcasts, and digital hybrids will rise and fall - but I do know I’ll probably still be watching from the sidelines with great interest. This article was only made possible by the support and engagement of the community of awesome, engaged, people around me. Thanks to Rainer and Video Game Tourism for agreeing to take a chance and run this series even though there was very little precedent for what I was trying to do (and I barely had more than a hunch that esports might be interesting to a critical and arts audience)! Massive thanks to Callie, who not only put up with my constant esports banter around the house, but who also served as copy editor for this whole series and as such basically made this whole thing legible for you all to read. Thanks to Jason and Sam for both constantly being willing to work through my half-crazed ideas and for always sharing their immense wisdom both for how game design and the industry actually works (or doesn’t). Special thanks to Will for being constantly grounding my observations by forever being able to connect them to a wealth of historical knowledge about seemingly every other sport that has existed (choose him for your trivia team). Also, I really want to mention how much the various people affiliated with my Sunday night gaming group contributed to this piece, both for letting me talk out my ideas but also for having innumerable savvy suggestions and concerns about the future of esports. Sometimes it’s hard to talk while playing, but we got there eventually! Thanks to all the various friends at game companies involved in MOBA and RTS production who downed copious beers and talked with me on and off the record about their passion for esports. Though I’m not the best player, all those late night conversations helped build a context for my investigation. Thanks to IndieCade and games curator Chloe Lister for the fantastic indie esports panel discussion which helped open up some interesting new ways of thinking about what constitutes an esport. Thanks the folks who run the L.A. and Irvine BarCrafts for being so enthusiastic introducing a total noob like me to the wider world of esports culture. If you shared any of these articles, offered corrections, or even just read the pieces, thanks so much! Finally, thanks to Christine and Eric from Southland Ensemble for inviting me to do the art show “Learned and Lost” in Los Angeles this Spring which was really the impetus for all of this further research about why esports and MOBAs are such a curious and potent part of contemporary culture.